Although political observers and observer-wannabees have given their opinions about the current drama at the Cebu capitol, I believe there are still a lot of things left unsaid. Some say that the assumption of Vice-Governor Agnes A. Magpale as Acting Governor is a clear political move by the Liberal Party to neutralize the Garcias. Some say that there is no clear change of power because a member of a dynasty has been replaced by someone who also belongs to a political dynasty. To paraphrase a statement by a member of the Magpale family: "bloodline is only as good as those who carry it with the kind of responsibility that such pride deserves ... yes, there is honor and there is privilege that comes with the history of a family but what is more important is that the members of the family carry on the tradition with humility and dignity...that is all that truly matters in the end..."
Though those in the know know that Acting Governor Agnes Magpale is a member of the Durano family of Danao, ordinary citizens are still taken aback when told that Magpale is actually a Durano by blood. The thing is, Magpale is not just a Durano. She is an Almendras, one of the most prominent families in Danao before the Duranos became powerful. 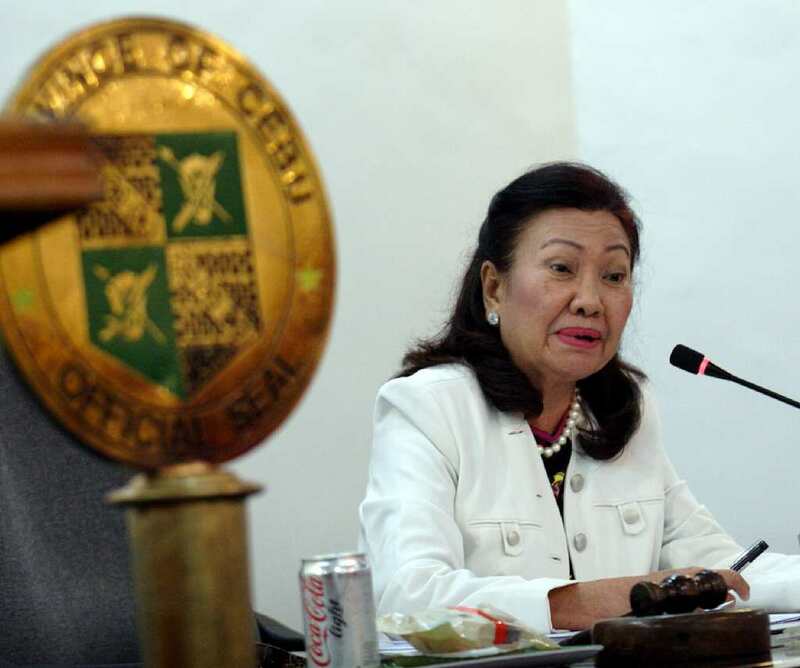 She is also a Dimataga of Lapu-Lapu and a Mercado of the old Parian in Cebu City. And her husband, the late Arsenio J. Magpale, was a respected and honest associate justice of the Court of Appeals. So when one looks at the suspension of Gwen Garcia and the rise to power of Agnes Magpale from the perspective of a genealogist, one sees the amazing twists and turns that have paved the way for this drama to happen. Magpale can trace a long line of public servants on her mother's side of the family. Her mother, Rosita S. Dimataga, was a sister of Mariano S. Dimataga, who was a Municipal Mayor of Opon (now Lapu-Lapu City) from 1938 up to 1942. After the Second World War, Mariano served again as the Municipal Mayor from 1945 up to 1961 when Opon became the chartered city of Lapu-Lapu. He continued to serve as city mayor until his retirement in 1968. Their older sister, Leonila, was the wife and first lady of President Carlos P. Garcia. The Dimataga siblings were the children of former chief excutive Bartolome Mangubat Dimataga and Leoncia de la Serna, still of another political clan in Opon. Thus, not only was she the niece of the longest serving mayor of Opon, she was also the niece of President Garcia, who is best remembered for his "Filipino First" policy. She can also count incumbent Representative Arturo O. Radaza (former Lapu-Lapu City Mayor) as a cousin, since Radaza's mother, Sindulfa de la Serna Ompad, was a third cousin of Agnes through the de la Serna line; she can also count all the de la Sernas and Tumulaks and scores of other old Opon families as relatives (including former Cebu governor Vicente Tingting de la Serna), as her mother's roots go very deep in the historic city of Opon, the place where the first Filipino hero (or one of his troops) slayed the foreigner Ferdinand Magellan. 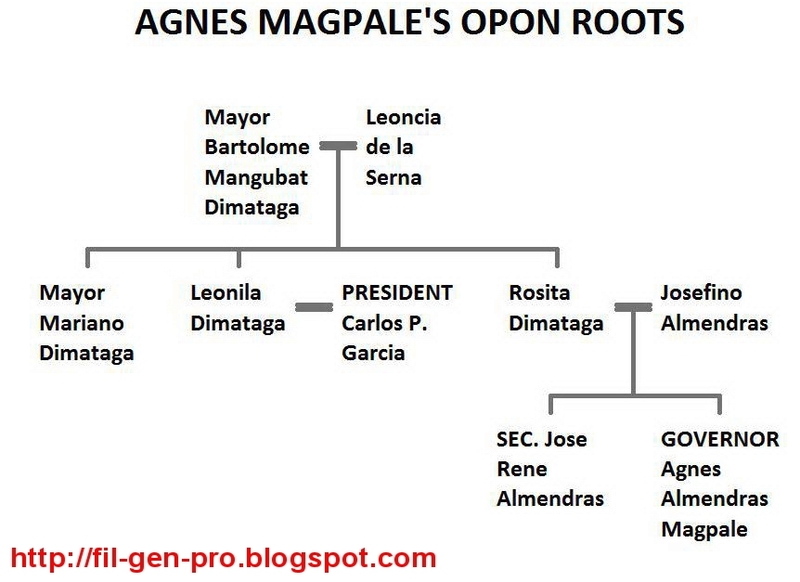 Now, if we are to look at Magpale's father's genealogy, we get a myriad of movers and shakers. Her father, Josefino Durano Almendras, belonged to what used to be warring families in Danao City. Josefino's father, Paulo Almendras, was the eldest son of Juan Almendras and his first wife, Cecilia Gonzales, while his mother Elisea was the eldest daughter of Demetrio Tan Durano and Bibiana Mercado. Although maritally allied the Duranos and the Almendras were at odds as the Duranos were close supporters of Mariano J. Cuenco while the Almedrases were die-hard allies of Sergio Osmeña. It was Governor Sergio Osmeña himself who appointed Magpale's father as acting mayor of Danao in 1952 when the previous acting mayor, Pedro Tecala, was gunned down during a Parents-Teachers' Association meeting. Needles to say, Tecala was also a close relative of the Almendrases as he was married to Paulo's sister Sofronia. Although the Duranos were suspected to be behind the slaying of Tecala, Ramon Durano was found innocent during the trial. Another close relative of Magpale was her father's brother, Alejandro Almendras, who served as a Senator of the Philippines from 1959 to 1972. A sister of Josefino was Cecilia Almendras de la Paz who served as governor of Davao del Norte, while a niece and first cousin of Gov. Agnes Magpale, Elisea Gillera Gozun, known as the leading activist of the environmental movement, served as Secretary of the Department of Environment and Natural Resources (DENR) from 2002-2004 and currently sits as a Presidential Adviser on Climate Change. Elisea Durano, Magpale's grandmother, was the older sister of Ramon Durano, Sr., the famous overlord of Danao City who for many years owned almost all the establishments and businesses in town. He started his political career in 1949 and ended it in 1988 when he passed away. It must also be noted that since the Duranos were allied with the Duterte family, also a branch of the Velosos of Cebu, Magpale can then add dozens of political families as relatives. Although not her blood relatives, because her grand-uncle Ramon Durano, Sr. married a Duterte, Magpale can also count the Dutertes of Davao (Mayors Rody and Sara) and Cebu City (Mayor Ronald) as cousins-in-law, along with the Locsins, Petillas, and Larrazabals of Ormoc and the Borromeos and del Mars of Cebu City. But despite her amazing political pedigree, in the years I've seen her campaign she has always been consistent in using her married name "Magpale", rather than make use of the more familiar Durano and Almendras names. Indeed, Agnes Magpale has been the epitome of nobility; nobility that stems from the fact of greatness and prestige of a family, but also the humility that is carried by her when she serves the people of Cebu. 1. The Almendrases have always been supporters of the Osmena and Aquino families. The Garcias, on the other hand, became who they are now due to Pablo Garcia's relationship with dictator Ferdinand Marcos. The current generation of Almendras are still loyal to the Aquinos, while the Garcias are loyal to PNoy's bitter rival, former president Gloria Macapagal Arroyo. 2. Magpale's father, Josefino, only became acting mayor of Danao when the mayor was suspended and the acting mayor, Tecala, was gunned down. Picture Magpale, suddenly becoming Vice-Governor when Vice-Governor Gregorio Sanchez, Jr., died. And then, in just a short period of time, picture Magpale becoming Acting Governor of the Province of Cebu. 3. The Almendrases are related by marriage to the Locsins and Larrazabals of Ormoc. It goes without saying that Gwen is related by marriage to the Codillas, the family of her estranged husband. Now picture this: the Locsins and the Larrazabals in a political rivalry with the Codillas! 4. Picture this: Magpale's late husband, Arsenio J. Magpale, was a model Associate Justice of the court of appeals. And now picture this: where is Gwen Garcia's petition for a TRO on her suspension currently awaiting decision? 5. Best of all, picture this: Magpale's maternal roots go very deep in Opon, Cebu, where most old families, including the de la Sernas and the Dimatagas, claim to be descended from Lapu-Lapu, the first Filipino leader to say no to foreign rule by slaying the invader Magellan. Now, finally, picture this: Gwen Garcia, a descendant of a Spaniard named Pablo Garcia, born in Ciudad Real, Spain, who came to the Philippines in the mid 1800s and whose descendants now occupy lofty positions in Philippine government. Picture again Lapu-Lapu slaying the Spaniard. I know it is a stretch and many of my former political science professors and classmates would probably groan and roll their eyes, but I believe Gwen should just pack up her botox and leave the Capitol before she, too, meets the same fate as that Spaniard centuries ago. 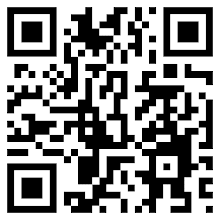 Hello...most of your genealogy info is true save for some that were left out and one erroneously presented. 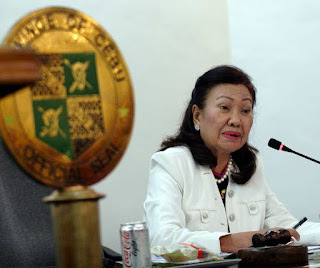 Agnes' father has two more siblings, Cecilia Almendras Dela Paz now deceased who also served as Governor of Davao del Norte for some time and youngest sister Socorro Almendras Gillera who is the mother of former DENR Secretary Elisea Gozun and currently Presidential Assistant on Climate Change. 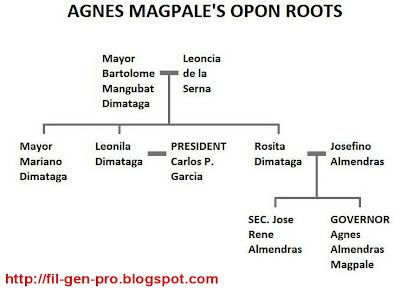 Agnes is actually related by blood to the Dutertes of Davao through our greatgrandmother Cecilia Gonzales, the first wife of Juan Almendras. Hi Tita. Todd here. This is actually my blog. Long time no see. Hi Todd. How are you? I was a bit surprised when Theya told me just this morning that this is your blog and about your interest in genealogy. It was my cousin Christian dela Paz's dad who emailed me the link to your blog. There is actually an Almendras Clan organization in Cebu, Davao and in the U.S. I am the unofficial source of information regarding the Almendras genealogy here in Davao. My cousin wanted to point out and verify the factual basis of your genealogy trace. I'll email you later on so you can establish the Gonzales link of the Dutertes and Almendrases. Okay Tita. Waiting for your email so I can rebise the article. Take care always!